When my wife, Lucy and I, found out we were pregnant with Luke, our third child, I struggled to come to terms with it. In my mind, having the two boys we already had was the perfect scenario. Bringing up children isn’t cheap, so financially we’d be able to support them and logistically, two children is much easier to manage. While Lucy was happy to be pregnant again, I was angry with myself for getting us into that position. We had a few sessions of counselling to help us find some common ground but it was a very difficult time. After our first scan we found out there could be problems with the baby, which didn’t help me come to terms with the fact that we were having a third child. At this point, I should have been strong for Lucy but emotionally, I had switched off. I felt that, given the potential problems, it would be best to terminate the pregnancy. It was selfish on my part, but with two healthy children I didn’t think it was right to upset the balance. However, after more tests we were given the all-clear and the pregnancy continued normally. When Luke was born, it quickly became apparent that he wasn’t well. He was very limp and wouldn’t feed. He spent some time in a special baby unit and eventually had a nasal tube inserted to help him feed. As he was so unwell, he spent the first year of his life in and out of hospital. Every time he went into hospital we weren’t sure whether he’d actually survive, so I would have to say goodbye to him again and again. Emotionally, it was extremely tough for both Lucy and I. I found myself dealing with feelings of anger, worry, sadness and frustration all at the same time. It was tough on Luke’s three and four year old brothers, Jamie and Charlie, too. They’d constantly ask questions, which weren’t easy to answer. I don’t think anyone really knows what life will be like with kids. You have this idealistic view that they might grow up to be a sportsman, a racing car driver or a famous artist. Like most men, I wanted to be the fun parent. I wanted to give my children everything they needed and spend as much time as I could with them. To read the full blog post, visit The Dad Network. 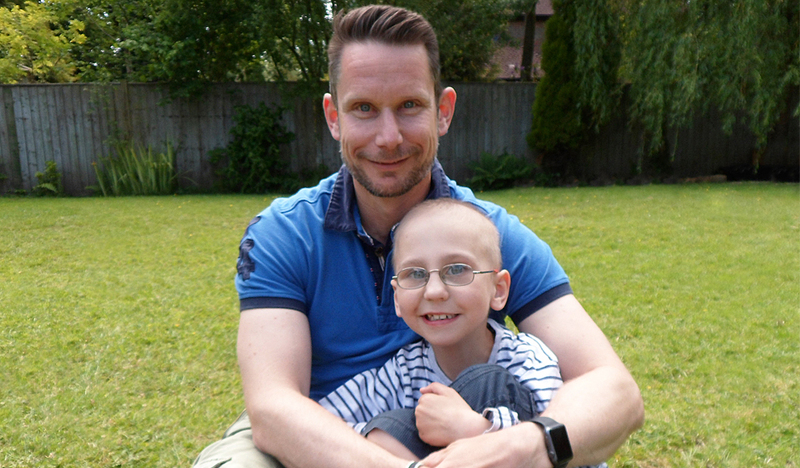 Rainbow Trust supports families like Mark’s. Help us support more dads who have a child with a life threatening or terminal illness.